Hyundai has announced that its new i30 N Line will cost from £21,255 when it goes on sale in September. Intended to combine sporty looks with affordable running costs (as per Ford's ST-Line models), the i30 N Line will share various styling aspects with the high-performance i30 N.
A twin exhaust, LED rear lights and 18-inch alloys complete the dynamic appearance, while the interior shares sports seats and a steering wheel with the i30 N.
The i30 N Line will be sportier to drive than the standard models, with Hyundai claiming to have tweaked the suspension, brakes and engine response in order to make it more fun to drive than the regular car. All i30 N Line models will come with a 1.4-litre turbocharged petrol engine producing 140PS combined with a six-speed manual or seven-speed automatic gearbox. For the £21,255 start price, buyers get cloth seats, chrome effect exterior door handles, air con, an automatic dimming rear view mirror and privacy glass. An N Line + model is also available, starting at £23,255. This features heated leather and suede sports seats with electrical adjustment, a heated steering wheel and dual-zone climate control. LED headlights are also standard, as are automatic rain sensing windcreen wipers and an eight-inch touchscreen navigation system. Buyers can choose from 10 colours, made up of two standard solid finishes (Engine Red and Polar White) along with eight metallic or pearl finishes, a £585 option: Champion Blue, Stellar Blue, White Sand, Micron Grey, Olivine Grey, Fiery Red, Platinum Silver and Phantom Black. 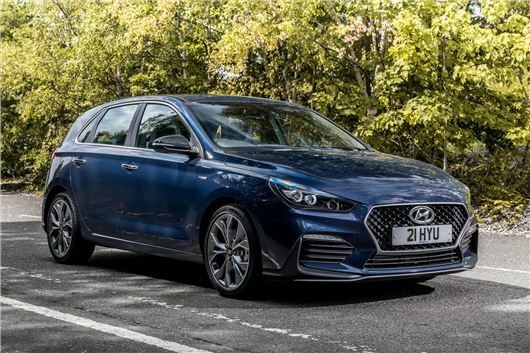 The Hyundai i30 N Line will go on sale in the UK on 3 September.